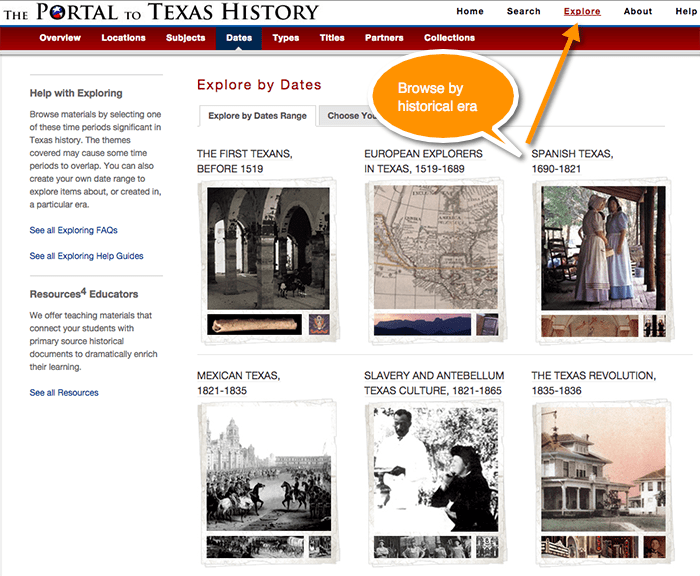 I first learned about the Portal to Texas History in a metadata course I took back in May 2012, with Amigos Library Services. The instructor used the Portal as a tool to demonstrate the three types of metadata–descriptive, structural, and administrative. I instantly became hooked on the Portal. Not due to its subject matter, because at that time I had no clue that there were Texas connections to my family history. But rather due to its design. The Portal to Texas History is simply one of the best designed digital archives I have come across in my years of researching amongst digital archives and discovery tools, as well as building and teaching them for my work. There is so much to highlight about the Portal, that I am writing this as a short series. This first installation discusses the concept behind the Portal, and its key discovery features. The Portal to Texas History provides free online access to archival historical collections from repositories throughout Texas. Launched in 2004, the Portal is hosted by the University of North Texas (UNT) Libraries. The Portal explains to potential partners that participating will help provide free public access to one’s collections as well as long-term archival preservation. Because of my professional background, I am always eager to learn about the technical backbone behind digital archival sites. It was clear, even back in 2012, that the Portal to Texas History does not run off one of the industry-standard tools for digital archives and repositories. The Portal is entirely home-grown, custom-built on open source technologies. Its front-end runs on the Django framework, its back-end on Python, and its indexing on Apache Solr. I will talk more about its metadata standards and usage later in this series. 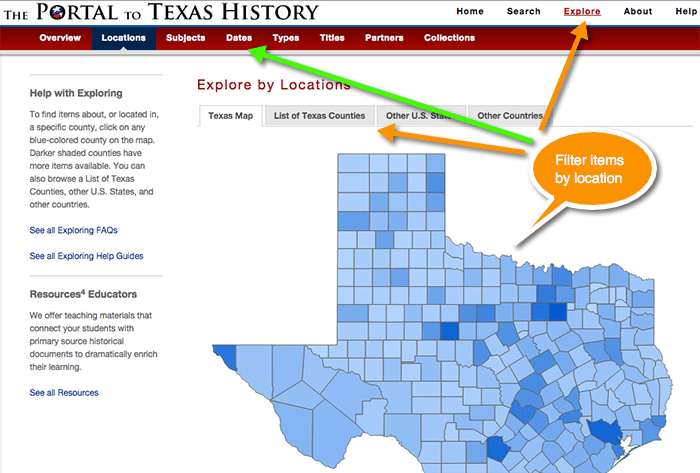 The Portal to Texas History has a very clean minimalist design and simple well-organized site-wide navigation that allows the researcher to focus on discovery. Yet it is packed with robust features that are important to researchers and educators. A tabbed search box allows site visitors to search among everything in the portal (a Basic Search), or just on particular types of items, such as books, maps, photos, or newspapers. This tabbed search box is displayed at the top of the home page, at the top of each page of search results, and can be accessed from anywhere in the site by clicking on the “Search” link displayed in the site-wide navigation menu located at the top of every page. Figure 1: Site-Wide tabbed search box. The Advanced Search tool–located in the right section of the tabbed search box–allows patrons to enter more fine-tuned queries, as well as search just within certain subsets of the archive: by a particular repository, within just a specific collection, by a specific language, or among certain types of items (maps, letters, newspapers, etc.). Figure 2: Search results view for an advanced search just among maps. The tabbed search box is displayed at the top of each results page. Unlike other disciplines, historical research is still heavily enhanced by the ability to browse. This holds true for physical book stacks in a library, as well as digital collections in an online repository. 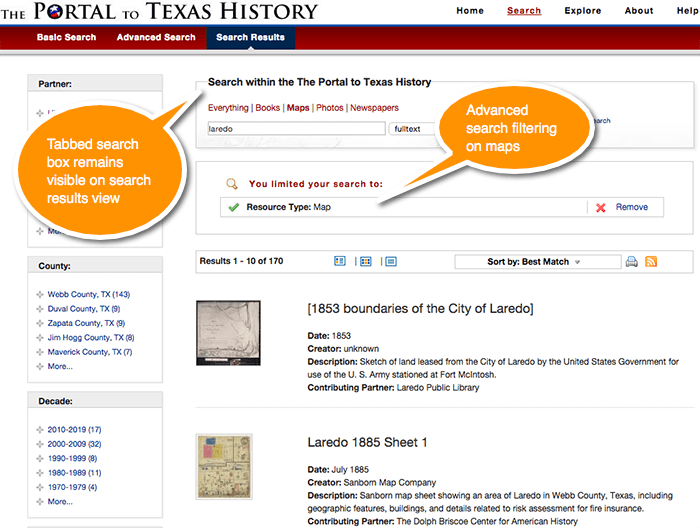 The team behind building and organizing the Portal to Texas History does a phenomenal job with creating and organizing descriptive metadata in a manner that allows for an optimal browsing experience. I will elaborate upon that concept more in this series, in examples I provide from my own research. Clicking on the “Explore” link located in the site-wide navigation menu opens up a sub-menu of recommended ways to browse the collections. One can browse by location, subject, date, item type, repository, or collection group. Figure 3: Explore the collections by historical era. The example above demonstrates the ability to browse the collections by particular historical eras. Consider how useful that is to someone like me who researches the periods of Spanish and Mexican-rule in the present day United States, or to someone teaching about the era of European exploration. Figure 4: Exploring the collections by subject location. Figure 4 illustrates how the collections can be browsed by location. This is not the location of the repository that holds the original records. It is the subject location (or subject coverage) of the particular item. The Portal provides a handy map view, which is useful if one does not know the specific county, but instead is researching something like border-entry points with Mexico. The tab displaying a List of Texas Counties, however, is quite useful to those of us who cannot recognize county locations on an unmarked map of Texas. In the next part of this series, I take a look at some of the features provided at the record or item-level view, once an item has been found. Go explore the Portal to Texas History! Thanks for this great write-up of the Portal! I work at UNT with the Portal, would you give permission for us to link to it from our next Portal newsletter?